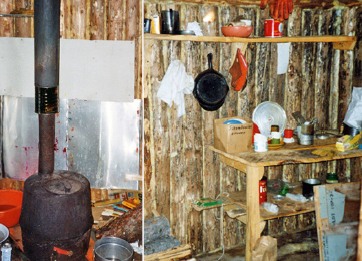 The interior of the trap cabin is cozy and efficient. Monday, December 6, 1982—got things ready to go back to trap cabin. Weather is warmer. Tuesday, December 7, 1982—Henry and Sally came and dropped off two batteries. I got a late start, took Darrel’s mail to him. Got one red fox. Found him just as fog settled at dark, lucky! Worked on trap gear, don’t feel like sleeping. Warm tonight. Wednesday, December 8, 1982—bright and very warm today. Ran line near here, re-baited it and scented it. Broke some trail along ridge of Hole Lake. Made fox set on this lake. Broke trail south of cabin, made one fox and Marten set. Saw a cow moose. Can’t sleep much. Thursday, December 9, 1982—slept late, nice warm day. Didn’t feel good this morning. Broke more trail and set traps. Red fox thawed out, skinned and stretched him. He had two porky quills in him. Friday, December 10, 1982—got things ready for the trip out. Saw two moose, had camp robber and rabbit in traps, an owl ate the rabbit. Made one fox set. Caribou had been moving around. Dan Chapel is back. Saturday, December 11, 1982—cloudy, -10° to 10°. Broke 3 miles on trap trail on Slide Mountain. Set marten and one fox trap. Visited Hoffman’s for supper. Sylvia made an apple pie and lots of coffee cake. This entry was posted in Journal Entry and tagged red fox, Slide Mountain, trap cabin. Bookmark the permalink.